Consists of correspondence and documents of Antoine Guerry Duclaud, a French officer employed by the Dutch West India Company who deserted and settled in the Dutch colony of Surinam (now the independent Republic of Suriname) in 1771. The papers document Guerry Duclaud’s move to Surinam with the intention of starting a plantation, his business renting the labor of enslaved Africans he brought from Guinea, and his return to Europe in 1775 after failing to make a profit. This collection offers insights into Dutch trade, economic conditions, the institution of slavery, and resistance to slavery by maroon communities in Surinam in the 1770s. Primarily consists of correspondence of Anthony Trollope and various associates/family members, as well as other miscellaneous documents. The letters are mainly business-related in nature and discuss various aspects of the literary and publishing world. Notable correspondents include author Thomas Hughes, publisher Nicholas Trübner, journalist George W. Smalley, Russian novelist Ivan Turgenev, and the Scottish novelist Margaret Oliphant Wilson Oliphant. An unfinished holograph manuscript of Trollope’s 1860 novel Castle Richmond, and a manuscript leaf of an article written by Henry James discussing Trollope (and later published in The Century Magazine, July 1883) are included as well. A new accrual from the author includes additional drafts and notes for Toni Morrison’s 2015 novel God Help the Child. This material will be available via access to digitized surrogates in the RBSC reading room pending digitization. Description was also added for additional digital files extracted over the summer from previously unreadable floppy disks using new digital processing tools. A recent addition to this open collection of miscellaneous Modern Greek manuscripts is the diary of Prince Nikolaos of Greece (1872-1938) documenting his travels to Peloponnese and Aetolia-Acarnania in April and May of 1898. A recent addition to this open collection of selected manuscript material by and about American attorney, politician, and planter Patrick Henry (1736-1799) consists of a 1795 letter from Henry to Major-General Henry “Light-Horse Harry” Lee III and an engraved portrait of Henry. A recent addition to this open collection of miscellaneous letters, documents, and other items pertaining to the history of the American West and Southwest consists of two letters from Silas Patterson to his brother Robert Patterson in Washington County, Pennsylvania, during Silas Patterson’s emigration west. The letters are written from Rock Bluff, Nebraska, on February 9, 1865, and Bitter Creek, Wyoming, on August 24, 1865. 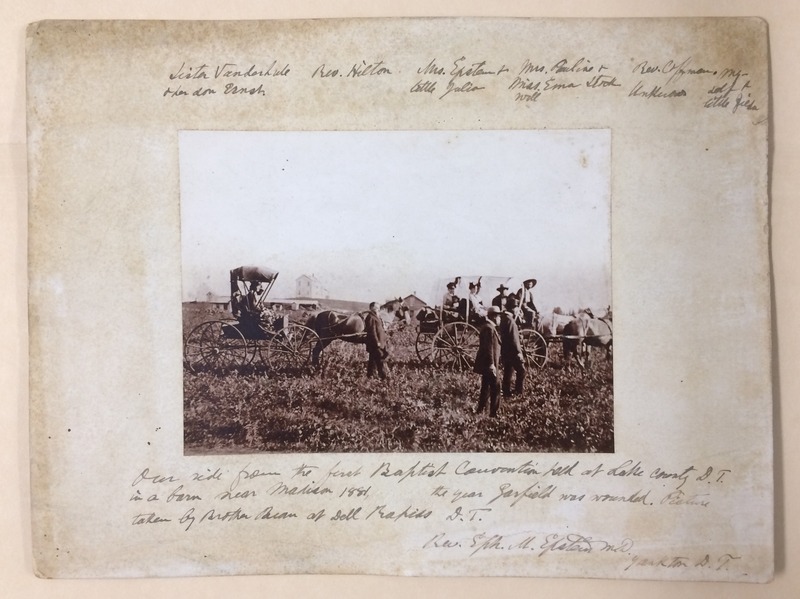 A new addition to this open collection of photographs of the Trans-Mississippi West consists of an 1881 photograph by Levi V. Bean depicting Ephraim M. Epstein and his party departing the First Baptist Convention in the Dakota Territory. Epstein was a Russian-born American who migrated to the United States at the age of 20 and became a Baptist minister after converting from Judaism to Christianity; he was also a physician, and later became the first president of the University of Dakota, now the University of South Dakota, at Vermillion. Recent additions to this open collection of manuscripts, letters, and documents of numerous English and American authors and artists include a letter from Baroness Anne Isabella Milbanke Byron (1792-1860) to her friend “Emily”; and an 1873 letter from Algernon Charles Swinburne (1837-1909) to Theodore Watts-Dunton (1832-1914). Recent additions to this assembled collection of materials by and about American singer, actress, and vaudeville performer Blanche Pauli (born Virginia C. Taney) include additional photographs, correspondence, clippings, and memorabilia related to her life and professional career. Pauli worked mainly in stock companies touring the northeastern United States and Canada from the late 1890s through 1904. The collection provides a glimpse into the life of a regional vaudeville performer at the turn of the century, as well as documentation of the songs and plays common among vaudeville and minstrel performers in the late 19th and early 20th century. Description was enhanced throughout the finding aid during the processing of new additions.